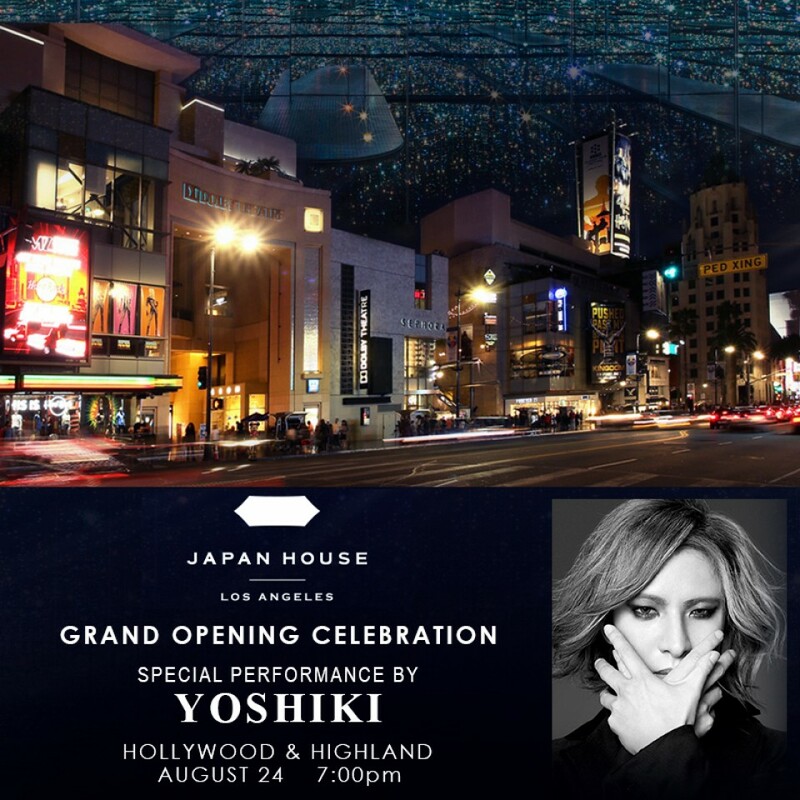 X Japan drummer and band leader Yoshiki is set to create a special musical performance to celebrate the grand opening of JAPAN HOUSE Los Angeles at the Hollywood & Highland entertainment complex on August 24 before the facility opening its doors to the public the following day. Yoshiki serves as an advisor for JAPAN HOUSE Los Angeles, part of a project from the Japanese Ministry of Foreign Affairs that seeks to "foster awareness and appreciation for Japan around the world by showcasing the very best of Japanese art, design, gastronomy, innovation, and technology, among others." Yoshiki has been invited to give a special congratulatory performance at the unveiling of the newly-completed facility, which will include a special cocktail reception and a seated dinner with international government, business, and cultural leaders, including officials from Japan’s Ministry of Foreign Affairs, the Consul General of Japan, as well as celebrities. Demonstrating his commitment to the mission of JAPAN HOUSE Los Angeles, Yoshiki personally made arrangements for a limited number of American fans to attend the private event in the unique, intimate setting in the heart of Hollywood, announcing the invitation on August via his official Instagram. Applications for the rare passes surpassed the capacity limit just minutes after the news was posted. Taking a role as honorary advisor for the LA facility is American businessman, entrepreneur, and philanthropist Larry Ellison. Ellison, the co-founder, executive chairman and chief technology officer of Oracle Corporation, is widely known for his active interest in Japan and his appreciation for Japan's art and culture. “JAPAN HOUSE Los Angeles offers a bridge-building cultural experience that will be exciting to anyone who is curious about Japan. By bringing Japan to America, the project will give those of us living in North America an exceptional opportunity.” said Mr. Ellison of the project. With facilities already open in London and Sao Paulo, JAPAN HOUSE Los Angeles will be the first to open in North America with a location that occupies two floors of the popular Hollywood & Highland entertainment hub, bringing with it various aspects of Japan to American and international audiences.